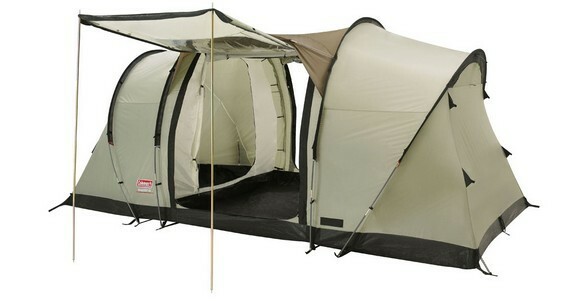 Designed for living convenience, every last detail is added for user comfort on this 4 person tent. Take for example the negative angle windows, designed for ventilation flexibility; they can remain open, even during light showers when moisture levels peak, to provide excellent ventilation and reduced condensation. Even, generous head height throughout the tent, coupled with a vis à vis layout gives more usable space and flexibility internally with increased privacy, perfect for family use. Handy features such as Peak Protection provides shelter from the rain as you rush to enter your tent when the weather takes a turn for the worst. Once inside, the sewn-in groundsheet keeps you dry and bug-free. Discover more about Coleman tents - click here. Tunnel tent structure that is easy to pitch. The vis-à-vis bedroom configuration provides privacy for all occupants. The Evanston has a fully integrated sewn in PE groundsheet, providing dry and bug-free camping. The living area groundsheet is a thick PE (140g/m²) to resist heavy family use. Wrapflex poles for increased strength. The Evanston features rain protection peaks; pole-tensioned fabric providing a porch area over the doors to prevent rain from entering the tent on entry and exit. An extra pole will run along the seam to prevent any water accumulation. Negative angled windows are positioned at each end of the tent, due to their angle, they can be opened during light right to increase ventilation throughout the tent. Vertical air vents bring in cool air from outside. Features 2 doors, one on either side of the living area for convenience for the family. Reflective, brightly coloured guy-lines are visible during the day and night. Optimally place guy-lines along the poles ensure stability in high winds. Y-guy-lines provide maximum support but less strain on the tent poles. Up in one pitching allows for quick and easy pitching; the inner bedrooms are pre-attached and they can be left in when packing the tent away. Continuous mesh pole sleeves are faster to pitch. The pole sleeves are blanked off on one side which allows for easy pitching.